Put nature first in Canada’s national parks. That was the overwhelming message sent by a record number of Canadians who participated in public consultations on the future of the country’s national parks and historic sites last year—a message environment minister Catherine McKenna, who is also responsible for Parks Canada, says she received loud and clear. Under federal law, Parks Canada is required to hold periodic consultations with the public to receive advice and feedback. The most recent, held in January 2017, became the largest-ever Minister’s Round Table on Parks Canada, with more than 13,000 Canadians participating via face-to-face workshops, email and regular mail, online forums and a Facebook Live event. 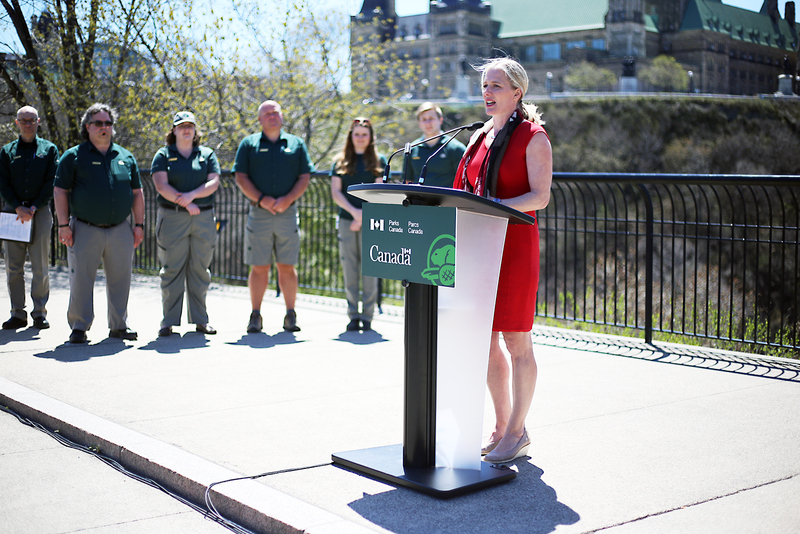 On Monday, McKenna released the report on the Minister’s Round Table and her formal response to the public feedback, outlining the actions Parks Canada will take to address Canadians’ hopes and concerns for the country’s network of protected areas. Chief among them is a renewed commitment to protect and restore Canada’s wildlife and ecosystems. “I heard from Canadians that more than anything else, they want the natural heritage of our parks and historic sites to be maintained and restored so that future generations can enjoy them as we do today,” McKenna said. Parks tourism generates billions of dollars each year and supports more than 40,000 jobs across the country, but rapid commercial development has led to the degradation of some sites, putting both wildlife and visitors at risk, the report said. Of particular concern are Jasper and Banff National Parks, which have seen visitor numbers and vehicle traffic skyrocket in recent years. McKenna pledged to take a close look at land-use management in the mountain parks to ensure that decisions about future developments are made transparently and to the highest environmental standards. “Ecological integrity” and science-based decision making are major themes running through the report, a fact welcomed by Éric Hébert-Daly, National Executive Director of the Canadian Parks and Wilderness Society (CPAWS), which advocates for the protection of Canada’s lands and waters in parks. Under the International Convention on Biological Diversity, Canada has pledged to protect 17 per cent of its land and 10 per cent of its oceans and coastal areas by 2020. Parks Canada will work with provincial and territorial governments and Indigenous peoples to finalize the creation of currently proposed parks and marine protected areas (MPAs), including Tallurutiup Imanga (Lancaster Sound), Thaidene Nëné, and a national park reserve in the South Okanagan-Similkameen. Along with Environment and Climate Change Canada (ECCC), Parks Canada will also explore options for protective measures in the Great Lakes, the St. Lawrence River basin and the Lake Winnipeg basin. Working closely with ECCC, Parks Canada will conduct research into the impacts of climate change within national parks, protect and restore critical habitat for species at risk, improve ecological connectivity within and around parks, and ensure that conservation science informs decision-making in parks and marine protected areas. Every five years, Parks Canada will be required to produce a publicly-accessible State of the Park report for each park. Parks Canada has pledged to involve Indigenous communities and groups in the management of parks, and to look for ways to restore connections between communities and their traditional lands and waters. And, building on the success of recent initiatives like the reintroduction of bison into Banff National Park, Parks Canada will ensure that traditional knowledge is taken into consideration in conservation projects.